Are you fed up with your blender? Are high end blenders worth the price tag? I wrote this review to help you answer questions like these and determine if the Blendtec Total Blender is right for you. Below you’ll find my research and personal experience using the Blendtec Total Blender, an appliance I have come to absolutely love! For years I got by just fine with my Oster Beehive blender, but as someone who makes smoothies everyday and spends a fair amount of time in the kitchen, I realized it was time to upgrade to a top of the line blender for all the reasons below. After researching the Blendtec (and Vitamix among other blenders) extensively and speaking with friends and family members who owned one, I knew the Blendtec Total Blender was right for me. One question lingered after my purchase, why did I wait so long? The more appropriate question might be, what won’t it do? With your Blendtec Total Blender you can make the perfect smoothie. Whether that’s the ever popular green smoothie, one containing ice cubes, seeds, or nuts, you’ll get a thick, creamy consistency without any chunks every time. Lower end blenders, like the Oster, can’t replicate the creaminess or blend as thoroughly. There’s even a handy Smoothie button making the entire process a breeze. In my opinion, this is the best blender for making smoothies, but that’s just the beginning of what you can create with your Blendtec. You can also make juices, dressings, soups, nut milks and nut butters, yogurt, sauces, spreads, marinades, salsas, batters, dips, and more. You can even grind up grains and make your own homemade baby food purees! With your Blendtec Total Blender purchase you’ll also receive a beautiful 213 page recipe book chalk full of recipes for making the various things I just listed. One thing stood out when talking to others who love their Blendtec, a feature which I’ve grown to love as well, preprogrammed blending cycles. In other words, there are buttons on the Blendtec touch pad for your various blending needs, like the Smoothie button I mentioned above. These buttons include Ice Cream/Frozen Yogurt, Ice Crush/Milkshake, Soups/Syrups/Fondues, Sauces/Dips/Dressings/Batters, Whole Juice, and Smoothie. Simply press a blending button and sit back and watch the Blendtec do it’s thing, it will shut off automatically when finished. These automatic blend cycles ensure the desired consistency and texture is achieved. Nobody is going to remember exactly how long and at what speeds they blend everything – the blending buttons remove any guesswork. Plastic Jar: The blender jar (BPA-free) has a volume of 2 quarts, and has a nice secure-fitting lid. This design helps to move food around and force it down to blade-level which means your smoothie (or whatever it is that you are making) will blend evenly. The jar is light weight, easy to pour and get food out of, and has handy measurements (cups and ounces) along the side. No need to worry about breaking your glass jar. 3 quart jars are now available if you need more volume. Power: The Blendtec has a commercial-quality 1,560-watt, 3 HP (Peak Horsepower) direct-drive motor and a 2-prong stainless-steel blade that spins at up to 29,000 rpm. In English, this baby is one powerful machine capable of blending just about anything. Maximum Nutrition: Unlock every ounce of nutrition in fruits in vegetables with Blendtec’s ability to thoroughly break down cell walls. This is especially important when blending greens such as kale, spinach, and chard. Sleek & Modern Design: Measuring in at 7 by 8 by 15.5 inches, the Blendtec Total Blender fits nicely on most kitchen countertops and is not an eye sore. It’s available in both white and black. Lifetime Warranty: Blendtec has a lifetime warranty on the blade; so you’ll never have to worry about it getting dull, a 3-year warranty on the motor-base, and a 1-year warranty on the jar. Easy to Clean: Cleanup is a breeze, simply add some warm water, a little soap, and press the Pulse button for a few seconds. Then rinse, and you’re done! Free Recipe Book: With your Blendtec purchase you get a beautiful 213 page recipe book, instructional DVD with 16 recipe videos, owner’s manual and users guide. Customer Support: I’ve called customer support twice and had excellent dealings both times. One call was regarding a damaged jar, which was quickly replaced. Blendtec stands behind their product. New and improved user interface making it easier to use and clean. The icons are back-lit, and disappear completely when not in use, leaving a beautiful, clean appearance. Sleek, stylish design, so your blender isn’t an eyesore on your counter, but rather a gorgeous piece to add to your kitchen. Optimized airflow that keeps things cool and extends the the life of your blender. I have found prices are consistently lower on Amazon as compared to buying direct from Blendtec. Here are the best deals on Amazon. Each of these are tagged “Amazon Choice”. The Total Blender Classic with FourSide Jar is currently around $300. The Certified Refurbished Total Blender Classic with WildSide Jar is around $200. This is a great deal! 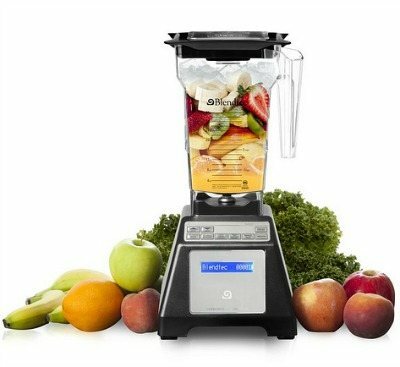 The Blendtec Designer Series Blender with WildSide Jar is around $400. BONUS: for a limited time only, I’ll throw in a copy of my e-book, Transform You Health with Smoothies (normally $27) if you purchase a Blendtec through my site. Just email me your receipt and I’ll send the e-book right over. One other thing I want to point out, Blendtec’s are less expensive than the Vitamix. Blendtec’s have received great reviews across the internet and an average of 4.5 stars from over 1,000 reviewers on Amazon. The reviews on Blendtec’s own website are equally glowing. “If you’re serious about getting a real blender, it comes down to Blendtec and Vita-Mix. I don’t think you can go wrong with either of these “real” blenders. All the others are fine, I guess. I’d been making do with a classic Waring and a cheap new thing that promised to circulate the contents in some kind of wave motion. Whatever. They both made enough noise to drown out a helicopter landing on my roof, and I seriously feared they’d fly apart and I’d die from shrapnel wounds. And they were such a pain to clean that I regretted pulling them out of the cupboard in the first place. I needed something better, and man, did I find it! -Vita-Mix is incredibly ugly — I wonder if that was on purpose or just some unfortunate accident? The most common complaint I’ve heard is that it’s too loud. In my opinion, this could be said for just about every blender. The Blendtec is definitely quieter than my Oster, and only slightly louder than my food processor. I don’t cover my ears or leave the room when blending, although both are an option if your ears are sensitive. Another minor complaint is that the jar scratches easily. This is true, if you don’t follow the owner’s manual and use abrasive cleaning pads and sponges. Stick to cloth and paper towel and don’t worry about it. Another potential complaint or con is the lack of a tamper to move the ingredients around should they get stuck when blending. I’ve had this happen once or twice. To alleviate, simply pick up the jar and shake it a couple times, then continue blending. No biggie. Where Can You Buy the Blendtec Total Blender? You can buy a Blendtec Total blender directly from Blendtec or through Amazon, which I recommend as their prices are almost always lower. Click here to buy the Total Blender Classic with FourSide Jar. Click here to buy the Certified Refurbished Total Blender Classic with WildSide Jar. This is an excellent deal! Click here to buy the Blendtec Designer Series Blender with WildSide Jar. Where Can You Read More About the Blendtec Total Blender? The best place for reviews from people who have actually used a Blendtec is Amazon. Click here to read more. Thanks for reading my review. Happy Blending! P.S. Feel free to drop me a line if you have questions or to share your experience with the Blendtec Total Blender.